Google announced they are expanding the +Post Ads to all advertisers who have over 1,000 followers on their Google+ Pages. 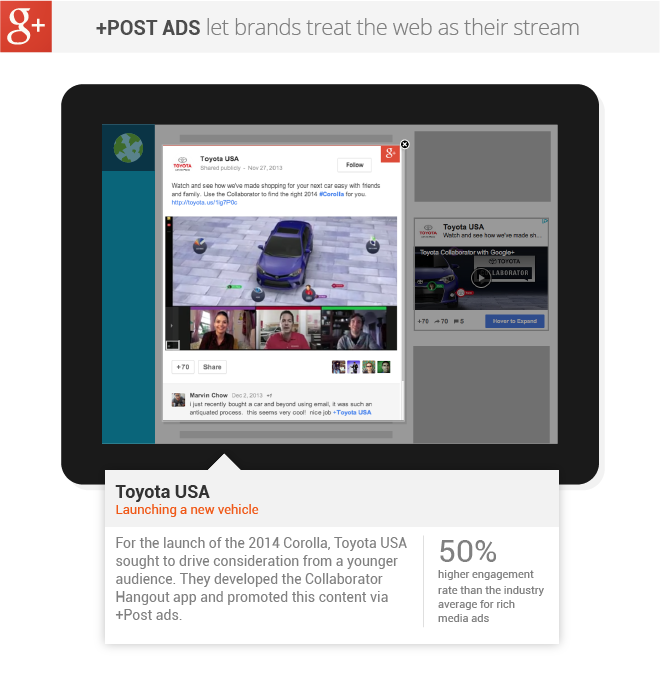 In addition, they are also testing two new features for +Post Ads. (1) Promoted Hangouts on Air: You can now promote your Hangout on Air with +Post ads that lets users take specific actions before, during, and after the broadcast. Users can RSVP prior to the Hangout, watch the broadcast live, and view a recording after the event. (2) Automatic post promotion: Now you can automatically promote your most recent Google+ post, and pay only when people engage with your content, extending the reach of your social content across the web.